"Avoid this site at all costs, even if it's free!" I am FINISHED with this lousy "dating" site. The men are LIARS, SCAMMERS and INCREDIBLY UNDER-EDUCATED. Apparently many of them have never heard of punctuation or Spell-Check. It's also amazing how many have "never" been on a dating site before and "don't know how to navigate or use it" so they immediately want to text or communicate your personal e-mail. If you gently explain that you do not communicate outside of POF before meeting & deciding if you want to know more about them, you probably will never hear from them again. It's also amazing how many will copy/post pics of military Generals, famous people, etc. and then assume you will be tricked into thinking that some well-known man is using POF to meet women. Given the level of stupidity of POF-men, I'm surprised that none of our Presidents have used POF. I also noted that most of the men in my age group are "widows"; have only ONE pic; are entrepreneurs; and have a HS diploma or less. I live in Northern VA and had no idea we had so many widowed men with little formal education and yet are successful businessmen or retired. I've also come across many profiles where the men lie about their age so they can attract "older" women because these women "really know what they want". Then in their written description they admit that they are a lot younger than they report so they can attract those smarter, more knowledgeable women. 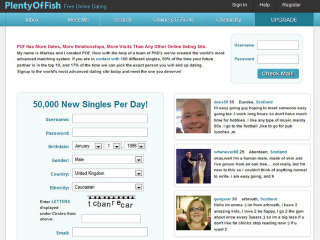 Hey, if I can see the problem with these guys wanting to prey on older women, can't the folks at POF see it too and ban these "men" from the site? I have also seen profiles where men express blatantly sexual & even perverted desires. I have reported these men to POF since their filters obviously can't weed out this kind of stuff. I could write a great deal more but hopefully you get the idea. I have reported numerous OBVIOUS SCAMMERS to POF and although they acknowledge (and thank) you, they don't always remove these profiles. I've even seen the SAME SCAMMERS, with the SAME PICS & SIMILAR PROFILES get back into the system by having a different user-name. I have reported these "men" too, and ALWAYS, ALWAYS asked POF what kind of screening process do they use. Of course I never get an answer. But ladies, here's the answer: POF DOESN'T SCREEN THE MEN BEFORE LETTING THEM ON THE SITE TO TROLL FOR UNSUSPECTING WOMEN. So buyer beware-- you are on your own to protect yourself from the numerous unscrupulous "men" on POF. I was lucky in that I never agreed to meet, or contact outside of POF, these sketchy leeches. I just hope you are wise and keep yourself safe, too. I have now terminated my subscription and just wish I had never spent a dime on POF.